School teacher Mark Enright from Calne has a rather unusual hobby. He builds fully-operational scale models of his favourite sci-fi robots and shows them at fan conventions around the country. 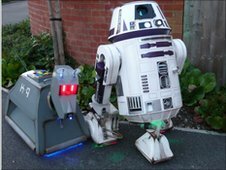 His impressive models of robot dog K-9 from Doctor Who and an R6 droid unit from Star Wars are made from recycled materials. Charity Daleks, the Wiltshire-based model builders group he is part of, also raise money for a variety of worthy causes. Mark explained that his hobby began at a very young age. "I started at about 10-years-old with Lego," he said. "I must have driven my parents mad because I tended to collect all kinds of junk and take things apart that I should not be taking apart. "From a very young age I always wanted to work as a special effects artist in film. "After studying for a Fine Arts degree, spending three years model-making, I eventually achieved my dream and worked for a while as a special effects designer at Shepperton. "I am now working as a teacher at a local school but this still gives me enough time to keep building robots and other props working from a workshop at home." Mark, a life-long fan of cult television and science fiction movies, has always had a fascination with robots, particularly the 'Astromech' droids featured in Star Wars. 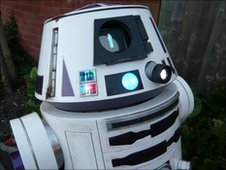 He said: "I built my first R2-D2 out of plasticine when I was about six, and my first K-9 out of cardboard at 10. "I usually build computer case mods which is the art of building custom computer cases. "I had always wanted to build a full-size replica Astromech but was not too sure if I would have the skills and patience to pull it off. I started by building a less complex full size R2-D2 computer case mod then moved onto a smaller K-9 computer case mod. Both of these gave me the confidence to start on full size fully working replicas. "I am part of a global Astromech club which has members all around the world who obsess over building R2-D2's and other Astromechs. "The plans for all the models are made available, and from these, builders can use their own artistic licence to decide what materials and how to build. "The building community is very supportive of each other with some excellent online resources and builders regularly share ideas and parts." Far from being an expensive hobby, Mark explained that he builds his models from whatever bits and pieces he has to hand. "I work with whatever materials are available," he said. "I am a great one for using recycled materials and not spending huge amounts of money. I like the idea of being imaginative with the materials I use and in solving new build problems. "All my models are built from scratch which means I manufacture all of the parts, it would be far too easy to just buy parts off the shelf then just assemble them. "I also want them to look real, as if they were real working robots so I take a great deal of time to work on the painting and weathering effects." It was recently that Mark decided to get his models out of the workshop and show them off to the general public at fetes, sci-fi fairs and fan conventions. He explained: "I recently got involved with a charity group called the Charity Daleks, and it was not until someone suggested I bring one of my Astromechs along that I had even considered taking the models out in public. "As well as showing with Charity Daleks I also attend a few sci-fi events with the newly-formed UK R2-D2 builders club." His R6 droid unit, nicknamed 'Emy' has become a particular hit at these events. "When people see the R6 Astromech, they are completely taken with her and become totally immersed in the illusion of an autonomous robot. "It doesn't matter that I am standing at the back of the crowd controlling her via radio control, the children and adults are still overwhelmed by her presence. "When I am at events many people ask 'where do you buy these from? ', or 'which TV episode did they appear in?'. "These are great comments because it makes me feel proud that I have built something that looks so authentic. Children of course love these kind of robots and for them they are not radio controlled, they are real." What began as a humble, solitary hobby has now given Mark new impetus due to the fund-raising activities it has introduced him to. He said: "Building these kinds of robots is very self-indulgent, so getting the opportunity to raise money for charities using these builds is very satisfying. "When they appear at events they have a great feel good factor, people smile, and in turn feel very supportive of the said charities we are raising money for. "The Charity Daleks group I'm part of is made up of a great bunch of people who are passionate about sci-fi, and want to use their passion to raise money for good causes. "The group members attend lots of events from small fetes to larger sci-fi conventions, and are always open to new event requests. One recent event, organised by Automatic Comics in Corsham raised over £3000 for a local charity." 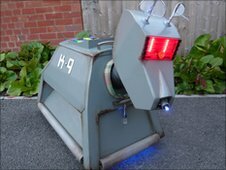 As for future projects, Mark is hoping to find a companion from the Doctor Who universe to join his K-9 model at charity events. He said: "I am currently working with students at the John Bentley school in Calne on a full size Dalek, and hopefully if we can raise enough funds it will be completed soon. "It will be really nice when it is complete because it will give the students the opportunity to get their creation out in public and join the charity Dalek group in events." See more of Mark's work at his blog.